VA loans are somewhat easier to get than conventional mortgage loans, which adds up to a big benefit for veterans or members of the military. 1. Do All Home Lenders Require a 20 Percent Down Payment? 2. Is There Mortgage Insurance on a VA Loan? 3. What Happens if You Have an FHA Loan & You Refinance? One of the ad-hoc benefits U.S. military personnel have access to are mortgage loans provided by the Department of Veterans Affairs, called VA loans for short. These loans have slightly relaxed lending criteria compared to conventional mortgages because the VA guarantees them. However, only veterans or active duty service members who meet the eligibility guidelines can apply. 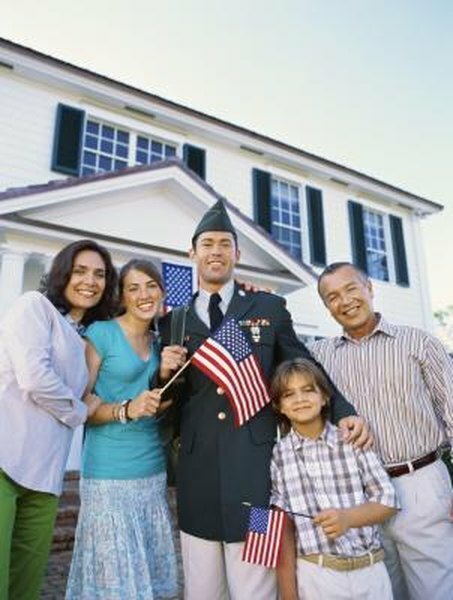 VA loans enable many veterans and active duty service members to reach the dream of owning a home faster and easier. Perhaps the biggest advantage VA loans offer is that they require no down payment. Saving for a down payment for a conventional mortgage can take a long time, especially if you're living on a fixed budget. Additionally, lenders are prohibited from requiring borrowers to buy private mortgage insurance. The Department of Veteran's Affairs guarantees the loan for the lender without the extra insurance cost, minimizing the lender's risk and the cost to the borrower. Before you can apply for a VA loan, you must obtain a certificate of eligibility. You'll need to fill out an application to order the certificate. Eligibility is based on the length and type of service you participated in. VA loans are open to members from any branch of the U.S. armed forces. Active duty service members are eligible after 90 days of service during wartime and 181 days during peacetime. Members of the National Guard and Reserves must complete six years of service before they are eligible. The widows of veterans who were killed in action or died of a service-connected disability are also eligible. Aside from the initial service eligibility guidelines, other approval criteria for VA loans are similar to the criteria for conventional loans. Applicants need to have good credit scores and earn enough income to support the monthly payments. Additionally, the applicant's debt-to-income ratio cannot be too high. Lenders want the ratio to be less than the maximum allowed value of 41 percent. The property itself also needs to meet the lending guidelines. The maximum loan amount the VA will back is $240,000, as of February 2013. Although there is no down payment requirement, you won't be able to get a VA loan without spending any money up front. There is a one-time loan fee assessed, as well as the general closing costs associated with all mortgage loans. The fee ranges between 1.25 and 3 percent of the loan amount. Closing costs also amount to a few percent of the loan amount, on average. These include fees for appraisal, title search and recording of documents. You might be able to lump the fees into the total loan, but remember that you'll be paying interest on the amount. Bankrate.com: Should You Try a VA Home Loan? What Does FHA Mortgage Insurance Cover?